Poet, scholar and my mentor, Van Brock, wrote of my book Salt and Iron "every poem may be prefaced by 'Farewell to Lincoln Square,' a poem he offers as a translation of the painting by Raphael Soyer, whose full foreground bulges with people of leisure, while Byrd, reading the painting, focuses on a small, remote man . . . ." It makes sense that Van would see that connection in my work because I grew up in a family that was first working class and I worked and sweated with men who knew how to use tools. I learned what it was to go home tired, sweaty and dirty . . . and then to get up the next morning and do it all again. The title of the poem links to a youtube video of me reading the poem. This poem originally appeared in the journal College English. who bends over into nothing? and rubbing his shoulders with alcohol. He breaks concrete for no good reason. that work makes for him. and when he eats pimiento loaf at noon? but it must be an Autumn day. wears a sweater and a long skirt. a few degrees of coolness. He works hard in the background. Everyone else walks away from him. I’ve always been someone who’s lived in two worlds, and perhaps that’s the definition of a writer. In high school, I was as interested in fishing and carpentry as I was in reading books. When I was a junior, I was seriously considering one of three major career fields: astronomy, cabinet/furniture making or journalism/literature. In college, I could never choose between a focus on literature or creative writing. While these two fields are closely related, in the world of academe, there are some major differences. So I completed the requirements for both. For my master’s degree, I focused on creative writing—poetry. For my Ph.D., I concentrated on American literature. When I moved into my working class neighborhood, I got along well with my next door neighbor, a master carpenter, who is generous with his knowledge and helps me as I do repairs and projects. It’s not that he has to tell me everything, as I am a competent (casual) carpenter, rather he lends the wisdom of experience and expertise. I’ll help him out with work on his truck, for he doesn’t know much about auto mechanics (and I do) in return for his hanging doors or other work. We collaborated on reroofing both of our houses ten years ago. I had probably lived next door to him for 2-3 years before he asked “man, what do you do?” “College English professor” was probably not the first thing he expected. Same with the folks across the street, who like my ’66 Ford pickup and have come over now and then when they see the hood up or the truck up on jackstands and me pulling the front suspension apart. Every year, after I finish my spring classes, I seem to fall into the same pattern. While I’ve jonesed all year to have time to write, once my grades are submitted and I have some time open, I’m focused on doing the most physical, mechanical, non-academic sorts of things possible. I dive into a project on my truck. I rip planks of walnut and begin fitting together a cradle for my neice’s new baby. I build a flag box out of mahogany for my late father-in-law’s burial flag. I throw my cast net for mullet. I once thought that maybe I was sliding towards the non-thinking side of the scale as an antidote for too much cerebral work—a healthy dose of carpentry to counteract too much modernist American poetry scholarship, replacing worn bushings on the pickup to balance the work of developing assignments and syllabi. Over the years, however, I’ve learned that there are really many different sorts of intelligence and that, for me at least, a balance between those types of intelligence are important to my work. There’s something important about the mechanical/spatial sort of intelligence. And it’s different from the logical-intellectual sort of intelligence. When I took the ASVAB in high school, the results said I’m supposed to be an Army truck mechanic. I guess they weren’t too far from accurate. If you’re not a mechanical type, take your car to a good mechanic when you have a vexing problem and see if you can follow his or her thinking. Or if you’re trying to learn an instrument, watch how your teacher accomplishes the same skills with which you’re struggling. A good literature professor can bring a poem or story or novel to life and it’s amazing to watch those mental gymnastics make obvious what was there, seemingly hidden, all along. Okay, so maybe this is all an excuse for why the early weeks of this blog were so spare. When I finished my summer classes and found that I’d been awarded a Rapid Returns grant, I was elated. And I began tearing the front suspension off a parts truck I’d purchased cheap so I could put disk brakes on my 66 pickup. For days, I’d come in, drenched in sweat, wearing my stained t-shirts and shorts, hands covered in grease and feel guilty about not writing. I’d trim the trees in the back yard, carry big branches on my shoulder, live in the world of loam and sawdust and come inside to shower, dirty and sweaty and guilty about not writing. As always happens, eventually, I would wake and have my coffee and feel that all I wanted to do was write, to work out the images, symbols, characters, settings rolling through my head. Some people say that some of that stuff needs to “percolate” until one is ready to write, but for me, there’s some necessary balance between the physical-mechanical and the creative-intellectual. If I emphasize one thing, I starve the other. I sometimes envy my daughter her cello playing, for it combines the physical elements of her fingers on the fingerboard, her hand on the bow and all the purely mechanical essential elements of getting sounds from the instrument along with the musicality and expression and artistry which is also required. She has it all in one package. I pick up my guitar and strum or pick a little sometimes, but that’s not my main thing. Similarly, I envy my fellow Rapid Returns artists who get busy with their hands and heads at the same time as they get dirty with clay and paint and sweat on stage. Yesterday, I wrote 1000 words for a novel I’m working on and rearranged the scenes in it. My protagonist is a pilot . . . and a mechanic. Here is a revision of the draft I wrote earlier of the Somme poem. Changes are fairly minor. This is a first pass through the poem where I'm working on things that stand out. Mostly I'm deleting wordy or repetitive lines or phrases that are just not necessary. I was working the last line with an eye towards making the meter work well. This is all done by hand on a printed out draft, but I've made the changes in Word so that you can see them more clearly. Each morning, from at least middle school through high school, I woke to a Vietnam veteran chopper pilot flying a DC-3 or C-47 (the latter the military version). Apparently, our street was used as a guide for his mosquito runs for the neighborhood and I could hear him come from the south around 6:45 a.m., the rumble of the twin radial engines getting louder and louder until the big silver WWII-era airplane filled my bedroom windows and the plane roared over the house at treetop level. The exhaust port of each engine spewed white smoke, like a scene out of Black Sheep Squadron or Twelve O’Clock High. It was a morning jolt of coffee before I was interested in coffee, my personal air show performance every morning, after which I couldn’t manage to stay in bed. This airplane, or another one like it, made rounds along the Upper Keys in the mornings and evenings, when the mosquitoes came out and, I imagine, when the malathion dropped from the air would have less chance of dispersing in the sunlight and heat. While mosquitoes never make picture postcards about Florida (except maybe ironically) and are conspicuously absent from advertising copy pushing the beauties of South Florida, dealing with mosquitoes was a big part of growing up in the Florida Keys. One night, my buddy Mike and I had played racquetball at Coral Shores High’s outdoor courts so far into a summer evening that we could no longer see the ball. Dusk was falling, the sky in the west still orange and it was still light enough to see ourselves, the trees, the buildings. We heard the engines of the mosquito plane. Soon we could hear it coming from the south and then roar up over the treeline as it made an initial run over the campus, which sat among mangroves and hardwood hammocks. The pilot banked, made another run, this time with the bug spray pouring from the engines. He’d come in from the ocean and open up the malathion as he came over land, fly straight toward the tall poles holding the lights for the football field and then bank impossibly at the last moment, or pull up almost into a stall as he cleared them. More fun for a local was watching that airplane roar down US 1 at low level, smoke belching from the engines, as if he was mortally wounded and attempting to land on the road, while panicked tourist spun their cars off the road and onto the gravel right of way. There was a more practical reason I looked forward to that airplane in the morning. I knew from watching from the kitchen window that those poisonous billows of smoke would come drifting down over everything, an acrid falling you weren’t supposed to breathe. That smoke would get into everything—bushes, up near the house, under the car. And it would kill the mosquitoes I knew were waiting for me. I knew they were waiting for me because there was a time when the mosquito plane didn’t come over our street right before I left for school. I was maybe twelve and had a very cool black bmx bike with skyway rims. I would ride this bike the mile or so to Plantation Key Elementary (which was K-7 until turned into a middle school many years later). In those days, I had a plan for getting to school without getting attacked by the mosquitoes. Once I was ready to go, I made sure my backpack was secure on my back before I opened the door. Then, I made a mad dash from the blessed air conditioning of the house to the side of the garage where my bike was leaning. Constantly in motion, I rolled my bike to the end of the driveway, where the bugs would have their one chance to assemble and plan their attack: the gate. In the moment it took to open the gate, roll my bike through and close the gate, they would have sensed I was there—sweat, carbon dioxide, whatever—and assembled their little swarm. If I stumbled or hesitated, they would be on me. If I kept pace, they’d be frustrated and have to wait for my mom and little sister. One particular morning they were buzzing around me, worse than usual, but not able to bite. I leapt aboard the bike and started pedaling. For some reason, I looked behind me and there was a little swarm, maybe the size of a beachball, following along behind me like something out of Bugs Bunny. Later on, they would supplement the airplane with a truck that would drive around the neighborhood in the morning and evenings. I always assumed that it was driven by someone other than the pilot, but I couldn’t imagine him being relegated to driving the old pickup with the spraying machine on the back, tooling slowly around neighborhood streets, making it’s whining buzz as it spewed out its smoke. Sometimes, actually, neither the plane nor the truck spewed out smoke and I never found out why it would be smoke sometimes and not others. The bug spray was malathion, a neurotoxin developed by the Nazis originally and adapted as a bug-killer. Its toxicity was apparently scaled down and it had a short half-life so it didn’t linger after it caused those mosquitoes to die their grizzly death. Still, it was suggested that people not intentionally inhale that toxic fog, which made sense to sensible people—which leaves out teenaged boys. The truck didn’t just drive around like a boring delivery truck. It made our whole neighborhood of Indian Waterways into a disco ball sort of fun house. If you were outside when it was happening. Which we weren’t supposed to be. Which, of course, we managed to find a way to be. It must have been one of those “I’m at Brian’s house” while Brian said “I’m at Greg’s house” sort of things. I was a good kid and didn’t usually lie to my parents, but this wasn’t hurting anyone and I just couldn’t ignore the opportunity any longer. “What? Oh, no, Mom. I was taking a bath.” I pointed to my lathered head. Mom picked up my shirt which was laying on the floor and reeking of malathion. Busted. I knew it and she knew it. I don’t remember any punishment. Perhaps the idiocy of the whole experience defied a clear response. Maybe she was just happy I wasn’t into something worse. It’s raining again. It started somewhere early in the morning and our dog whined to get into my daughter’s room so she (the dog) could sleep next to the bed and feel more safe. A few bands of rain came through and I could hear the heaviness of rain on the roof, and then it settled into a consistent rain. Now, the drops are hitting the tarp on the Albacore sailboat, the aluminum roof of the truck topper and leaves of the live oaks. Where the sky might sport a bright blue at 9:00 a.m., telling me I’m up too late toget in a good bike ride, instead it’s a diffuse grey and everything seems soggy. I’m reminded of the winter Lewis and Clark spent among the Mandan in Washington state, where there was so much rain that their clothes rotted away and they began to complain of the constant diet of elk and eventually making clothing out of elkhide. My father was a big fan of weather, or of watching the weather, and somehow I’ve inherited that interest. He would read the weather section of the paper first, had one of those weather stations in the house with the three dials that included barometric pressure, temperature and wind speed. There was a wind speed sensor on the house with those three little cups. He watched the weather portion of the local newscast on channel 7. When cable came out, we found The Weather Channel on quite often. His obsession was less a concern for meteorology than for its affects, I think. He grew up in Pensacola and lived in the Florida Keys during the first 18 years of my life, so his interest was, in good measure, practical. If you lived in Florida, and especially in the Keys, you kept a weather eye. In the winter (better called The Dry Season), nothing much happened, but in a Keys’ summer, a hurricane could come out of nowhere and you could be caught without time to put up shutters, sink the boat in mangroves, board up the business building. Ships at sea and people from the Bahamas radioed ahead that the Labor Day Hurricane of 193? was bearing down on the Keys, but by the time people had acted, it was too late to get a train from Miami to Lower Matecumbe to rescue the WWI veterans working on the Overseas Highway. Most of them died and the rail cars from the late train were flung into the sea by the force of the storm. A few took refuge inside the locomotive and survived. Ernest Hemingway filled the Pilar with water, food, first aid supplies and motored up to the area with the help of a Bahamian guide. What he saw there was worse, he said, than what he had seen on the battlefields of WWI in Italy. I don’t know if my father was born in a storm, but I was three months old when my parents moved to Key Largo and I was five months old when Hurricane Betsy roared across Key Largo in 1965 on my father’s birthday, September 8th. When we’ve talked about that storm, he never mentioned that it was his birthday that night. The year my father was born, all of the hurricanes avoided Pensacola. or a blessing. Perhaps such charms are always both. in Key Largo while Hurricane Betsy howled outside. and wind and the mortal feelings from the beings inside. all of it in a wordless memory. That ancient god visits me in thunderstorms. out at the wrong time. He put her on the rocks. moored to someone’s vacant dock. and her eyes spoke fear and respect of something that big. that I fitted better when the skies had cleared. this life swirling in grey bands all around me. Last night, a powerful thunderstorm rolled through Hillsborough and northern Pinellas counties. Shawna and I saw it building as we were pulling grass out of the fogfruit in the front yard. By the time we were having dinner, thunder was cracking and lightning was flashing and a warning banner ran across the bottom of the TV screen on the Weather Underground channel. On the table was a copy of Pinyon's 20th anniversary issue, with my poem, "Late Trail" in it. I reread the poem and then passed it to my wife, as it had been a good ten years since she'd read that poem which I wrote at the Hambidge Center in Georgia. That poem had been making the rounds for at least that long. We had been talking about our daughter, Carly, who is playing her cello at the Philadelphia International Music Festival for the next two weeks. I lay out all of the random stuff in the above paragraph as a way of charting the genesis of the poem below. As usual, a poem comes from a variety of ingredients that seem to come together at one place and time: storm, poem, daughter, father's death in the background. Rereading "Late Trail" probably had me thinking in terms of myth and symbol so the storm was likely making some sort of connections beyond just the concerns listed in the TV warning. Discussion about my daughter had me thinking about her and stuff we'd done together, and that led to the memory of sitting on the tailgate of my pickup with her watching a storm. As I tried to remember the details of that day, I remembered that the truck was in the garage of the house we rented back then because the timing chain had eaten through the timing cover and coolant had forced its way into the cylinders. I'd called my dad and he'd agreed to come down to help me diagnose the problem, which we both figured was a cracked block or cylinder head. So Dad came down and we tore the engine down, figured out the problem and Dad left when it was clear I knew how to reassemble the engine. Ten years later, I would find that failed timing cover when I went through my father's stuff after he'd died. I'd put a clock in it and a note thanking him along with a picture of the project. So, I had the connection of the memory of my dead father with the experience of watching the storm with Carly. As I drafted, I began to be aware of the connection of the father-child relationship in the poem. My dad had come down to help me understand something (the engine) as he always seemed to know something about engines even though we never really worked on cars when I was a kid. When Carly sat on the bed of the truck with the storm raging outside, she did so with a confidence that if her dad was doing it, it must be okay. Further, the experiences I had with my dad and with my daughter were both silent experiences. So here's the draft. Y'all hear? Draft, draft. My wife says it's good, but she's kind with my drafts and I know it will need work. But I think it has good bones. (It should be single-spaced but I'm having problems pasting it in that way). The pickup was in the garage and the tailgate was down. intake manifold, cylinder head, timing chain. The block was still where it belonged. to help me tear it down and diagnose the problem. not unlike his bad heart valve that would do him in. so he left again for Pensacola. just outside the open door to the garage. could keep the deadly world at bay. My 1966 F100 Ford pickup. It’s funny how people can be so interested in the artistic process of writers, artists and composers. I don’t know of anyone who asks about the process used by auto mechanics or plumbers, but they should. To those unfamiliar with what goes under the hood of a car, auto mechanics are akin to shamans or wizards. When you learn about mechanics, however, things are usually a little less convoluted. Any mechanic will tell you that engine issues are always some variation on air-fuel-spark. If one of those things is off, the engine won’t start, run, stop, accelerate, etc. Today, of course, many mechanics plug the car into the computer and it tells them what’s wrong. But most cars still run on internal combustion and need the same air-fuel and spark that the first Model T’s used. Barring computers, though, a good mechanic will walk through a particular process to confirm or eliminate parts of the engine as culprits: is fuel getting to the engine? Is the system letting air into the carburetor, injectors, cylinders? Is there electricity to turn the starter? Is there spark getting to the coil and the spark plugs? A seasoned, inspired mechanic may have seen many symptoms over the years an may intuit a solution based on smell, sound, initial symptoms. But this is only wizardry if you are unfamiliar with such things. I think it’s a little that way with art and writing. At writing conferences, I’ve seen novice writers ask accomplished and famous writers all manner of questions in an attempt to find the secret to those writer’s success and ability to move readers and create magic. Do you write on a pc or a mac? What program do you use? Do you write in the morning or at night? What writers do you read? What books about writing do you read? What kind of job should a writer have? Do you outline or develop as you go? Free verse or rhyme? Do you drink when you write? Red wine or white? Varietal? What sort of whiskey do you drink? Cat or dog? What sort of paper do you use? Revise on the screen or on the paper. What music do you listen to when writing? And on and on. There’s a persistent need to see writers, like talented mechanics, as something special because they have some special way of doing things that others don’t have. To be honest, I sorta like this approach. It’s neat to have someone look at you as if you’re holding a special wisdom of the universe, a key mystery. Maybe a little of that is true, but most writers will tell you that you gotta write. But Creative Pinellas wants me to write about my own process. It’s often different for prose and for poetry and I find that my day job—writing, lit and humanities professor at St. Petersburg College—often gets in the way of my writing. Sometimes I write along with my students and that helps, but all of the procedural things that go along with a busy job make it hard to put my head in the space that allows one to pay attention to the little thoughts (some say this is the Muse) calling for attention: “hey, the dead squirrel you picked up off the street rather than let it rot and be seen by children walking home . . . what’s up with that? Maybe you should write about that.” When cutting the grass, I left an island of fog fruit (or frog fruit), which many just see as weeds, alone and allowed it prosper. Butterflies seem to flock to it, it seems a microcosm of something, something larger about my life, my existence in my neighborhood, about paying attention to the small things in life. But sitting down to write about this when I have to remember to pay a bill or grade a raft of essays or call back Mr. Soandso, is challenging to say the least. Students of literature have often read about English poet Samuel Taylor Coleridge having a bad headache and taking a dose of laudanum of opium (no aspirin or ibuprofen in those days), falling asleep and having this amazing dream. On waking, he began to write “In Xanadu did Kubla Khan / a stately pleasure dome decree” and began to flesh out the wild and exciting things he’d seen in his dream. Then someone knocked on his door. A man from the neighboring town of Porlock had to see him about some mundane business. 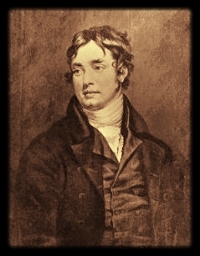 When Coleridge got back to his work, the rest of his dream was gone. No one remembers what boring stuff this guy from Porlock had to discuss. I’m most thankful that the Rapid Returns grant has given me time so that I can focus on those things the muse keeps whispering. Not only that, but for a few months, I can allow myself to follow those thoughts in ways that I cannot when I’m focused on more mundane things. Ironically, mundane things are often the writer’s friend. Clint Eastwood (and many others) say that they get their best ideas in the shower. I don’t think this has much to do with soap and water, but instead on focusing one part of the mind on something fairly simple and physical so the other part can deal with the world of symbol, imagination and myth. I love doing carpentry, auto repair (the only computer in my 1966 Ford truck is in the car stereo), cycling, fishing, sailing. All of those things require one to focus one part of the mind on the task at hand but allow the other parts of the mind to roam and look for connections among seemingly unconnected things. If you don’t pay attention when you’re riding your bike, you’ll run off the trail, or worse. Working on the truck makes one think in terms of spatial relationships. Sailing requires attention to sail trim wind, other boats, weather. So, I do things like this instead of sitting and trying to think Deep Thoughts. But I’m most productive when I do plan time to sit in front of the computer and either draft of revise. That’s when those thoughts come together. And sometimes you can’t wait to write them down so you have to stop what you’re doing and pay attentionto the Muse, like a cat who jumps on your chest or the dog with her cold nose who says we need to play ball now! That’s perhaps the hardest thing for many writers who have other responsibilities—allowing that the writing is important and that it’s okay, that it’s necessary, to write that poem about fogfruit, the essay about the dead squirrel, instead of returning that call, or filling out those forms, or whatever. In an upcomingpost, I’ll talk more about the actual process of writing and how it works for me. The poem I wrote in response to the Somme Offensive generated some kind and supportive responses, in person if not on the blog. (I hope you'll respond to the comments section below with your thoughts!) Not surprisingly, one of those comments was from my mom, who would put the poem on her fridge if she could. That's as it should be, I guess. A writer needs support and encouragement. But I know the poem is a draft and I know how it can be stronger yet, that it can communicate and connect more clearly and effectively. And the idea of connectiveness calls me to write on Independence Day. My poetry students get into writing, as we all do, I guess, because of the expressive aspect of writing. They have ideas, emotions, experiences and they want to express those things to themselves, to their journals, snapchat, facebook, class, the rest of the world outside their heads. And perhaps that's where a draft begins, too. We say "I just had to get that out!" as though out and in are different. That's all fine, but if expression is where a poem stops, then it's not really a poem, for the poems that really work, those that reach us so that we read them again and again because they tell us something true, are poems that connect. I think that's what we're up to from the very beginning of any artistic utterance, and the connecting part is the craft. In "I Hear America Singing" (one of his shorter poems), nineteenth century American poet Walt Whitman works explicitly to connect seeming differing elements of America into a whole--E Pluribus Unum, if you will: out of many, one. In general, that's what a poem should do, show us how our varied experiences are really part of the human experience and how that one individual experience is really universal. If you wish a more contemporary poet (though, somehow, Whitman always seems contemporary), consider Richard Blanco's poem for President Obama's 2012 inauguration, "One Today." You can watch it here on youtube. A British soldier carries a mortally wounded comrade to an aid station. The Battle of the Somme began a hundred years ago today at 7:30 a.m. The British soldiers fighting there included many who had enlisted in "Pals" regiments--those made up of football clubs, civic clubs, coworkers. Many who went to France did so in a spirit of excitement and righteousness of purpose. They would drive the Germans back and rescue France.. The reality of the battle was that 20,000 men were killed in the first minutes. Many more died charging into German machine guns which were supposed to have been destroyed by a weeklong artillery bombardment. After the Somme, any sense of optimism, of purpose, was destroyed as well. Many felt the war would go on forever. My darkness is not like yours, though it is darkness. though he knew they could not be. that had never worked quite right. "stay home and take care of yourself"
and he never knew I had outlived my own cancer and chemo. remembering once again that he is dead. have thought about something like that. until we turn and face the living again. The other Rapid Returns fellows have these great pictures of them doing their thing with paintbrush in hand, dancing across broad floor, or up on a scaffold, painting a building. Perhaps this passes for an "action" shot of a writer? My friend, artist Kevin Grass, does a wonderful thing by showing his work in progress on his artist Facebook page. That's brave and generous of him, as it's sort of like taking your clothes off in your front yard and saying "this is what I start with!" While I promise not to disrobe amongst the Shepherd's Needle and Beach Sunflowers, I will start a poem here and see what happens. I imagine you'll see all the old scars and unsightly bulges as well as muscle and bone in the process. I'm hoping the poem will end up well-clothed and trim before too long. It is because we know how much there is to lose. Those sound like they may make the last two lines of a poem. Or maybe they're overstated. Or maybe they say rather than show. Or maybe the idea is good, but the lines are not. I know that the "we" I'm referring to is middle-aged men (I'm 51). And I'm thinking about how younger men are comfortable taking chances, how they will look at old guys like me and misunderstand the caution one develops for tenuousness or cowardice. But it's also what makes older guys ready to fight harder for certain things. Well, that's a lot of ideas and, as Stephane Mallarme said to Edgar Degas, "poems are not made out of ideas, they are made of words." So, rattling around in my head are early thoughts of what words and images might fit the ideas here. But I'm not going to try to purchase them from the Image Store, but just wait and see what comes up. I'm pretty sure there's something concrete and mythic hiding in the shadows that fits this, and when it knows I'm receptive, it will come forward. I hope so, anyway. I'm also thinking a little about the meter in those lines I wrote. I won't trouble it much now, but I have my eye on it. And what does the air cleaner for the '66 F100 have to do with this? Probably nothing. I like working on my truck, doing carpentry, going for long rides on my bike, fishing, lots of things that are fairly solitary and physical, I guess. Sort of like Wordsworth's going on long walks. Or Clint Eastwood (among many) who says "you get your best ideas in the shower." I've learned to let an idea take hold and then to concentrate on something kinesthetic and non-verbal to let those ideas come together on their own. More later! I'm looking forward to seeing what happens. Apalachee Review has a nice review of my recent book, Salt and Iron. AR will also be publishing a poem called "This is the Name for the God Who Speaks," which is equally about my connection to Florida landscape and storms and about my father, who passed away in 2012 at age 70. If AR publishes that poem on their site, I'll link to it. Pinyon, at Colorado Mesa University, is publishing a 20th anniversary issue in the next year or so. They'll be publishing a poem of mine called "Late Trail" written at the Hambidge Center for Creative Arts and Sciences in that issue. There are quite a few links to my poems, to youtube videos of my work, and to my curriculum vita on my Salt and Iron website. If you're enjoying what you read here, I hope you'll visit that site and nose around a bit. Note: This is November entry about my yard will help make sense of our recent turn into summer. It is apple season up north now. Honeycrisp, Red Delicious, and all sorts of other apples we never see are flooding the supermarkets. I know that in North Carolina, the leaves in the mountains and even the Piedmont are a dozen shades of red and yellow. In west central Florida, people not from here are confused why the month of November doesn’t yield all those things promised further north. In Clearwater, those of us who watch know this season but more as a version of spring than a beautiful harbinger of the temporary death of all the plants and the vacation of the birds and animals. Around here, this is when animals arrive. Yesterday, a yellow wren flitted along with wood fence. Kingfish and Spanish mackerel have been crashing schools of whitebait for weeks now (though I’m too busy to get out and catch them). It should be time for a mullet run, too. About a month ago we knew that fall was here when the rains abated (really, we have rainy seasons and dry seasons here) and the grass miraculously slowed its growth. This was great cause for joy for my teenaged daughter, who has recently taken on the job of mowing grass and was growing exasperated when the yard required mowing every five days. She would stand at the window and sigh when it rained, knowing that the sun would come out the next day and Friday afternoon after school she would be mowing grass and working up a sweat. The grass still grows, but more slowly, and our diverse lawn of sod, beggar’s tick, cupid’s paintbrush and other “weeds” blossoms into a variety of small flowers.